Problem Definition and Agenda Setting. Secondary actors: Elected executive and legislative staff. 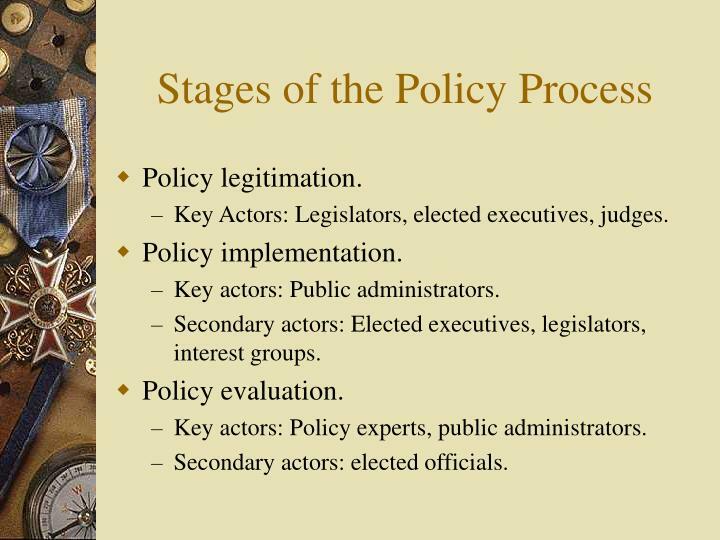 Key Actors: Legislators, elected executives, judges. Secondary actors: Elected executives, legislators, interest groups. Key actors: Policy experts, public administrators. 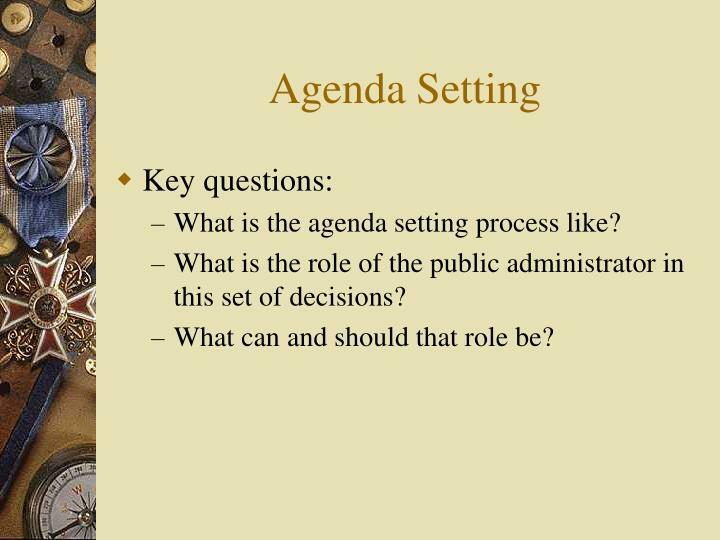 What is the agenda setting process like? What is the role of the public administrator in this set of decisions? What can and should that role be? 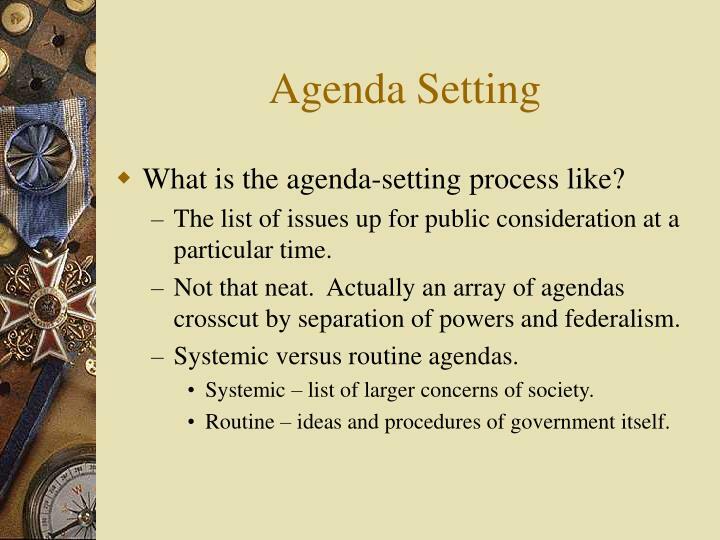 What is the agenda-setting process like? The list of issues up for public consideration at a particular time. Not that neat. Actually an array of agendas crosscut by separation of powers and federalism. Systemic – list of larger concerns of society. Routine – ideas and procedures of government itself. 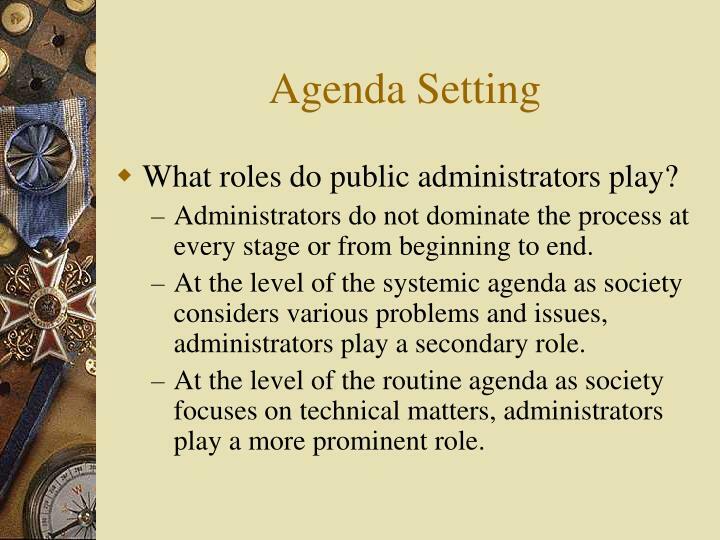 What roles do public administrators play? Administrators do not dominate the process at every stage or from beginning to end. At the level of the systemic agenda as society considers various problems and issues, administrators play a secondary role. 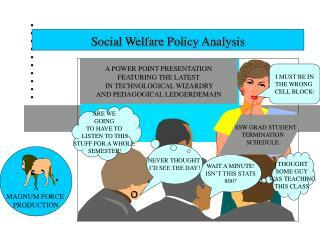 At the level of the routine agenda as society focuses on technical matters, administrators play a more prominent role. 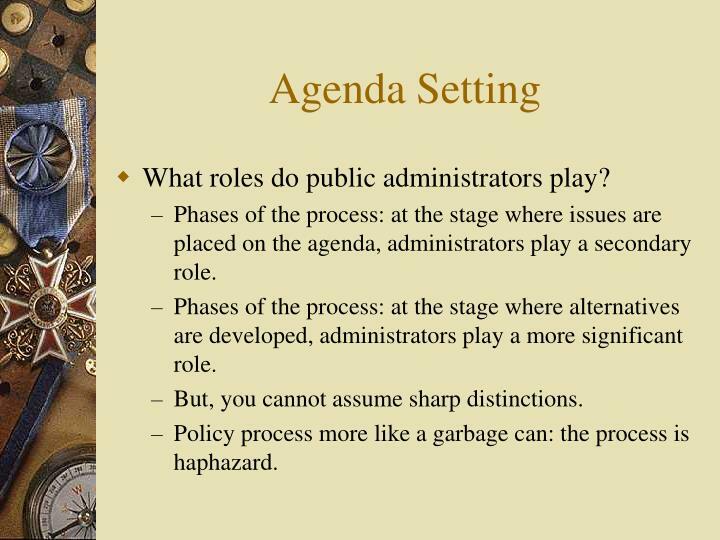 Phases of the process: at the stage where issues are placed on the agenda, administrators play a secondary role. Phases of the process: at the stage where alternatives are developed, administrators play a more significant role. But, you cannot assume sharp distinctions. 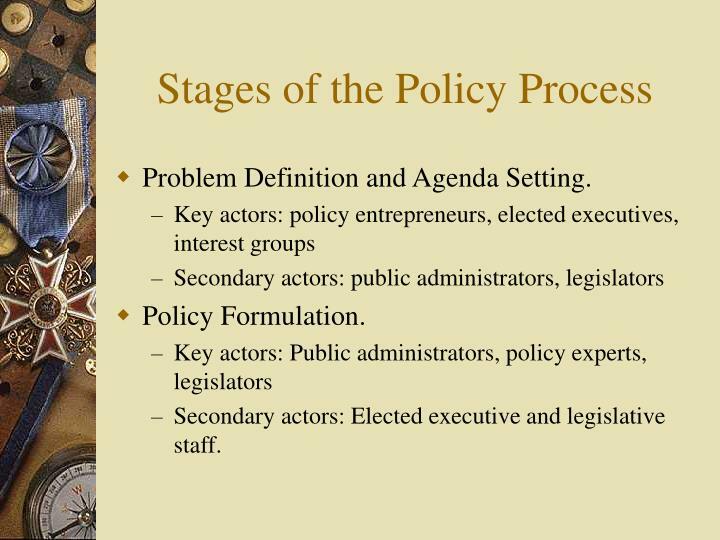 Policy process more like a garbage can: the process is haphazard. 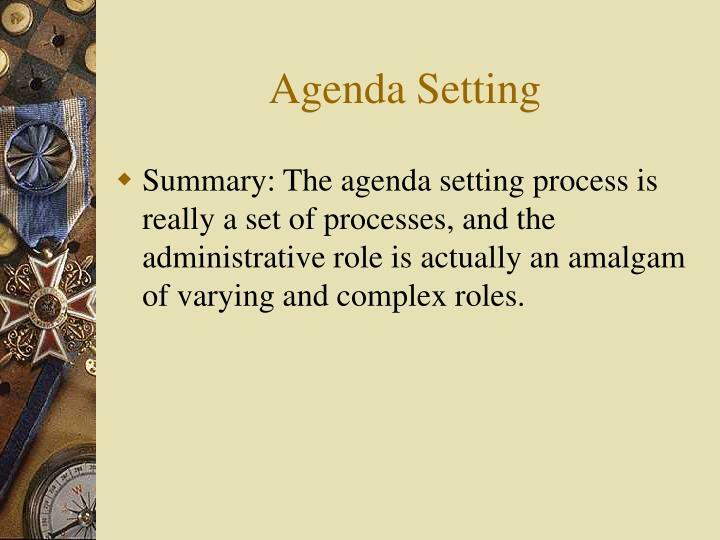 Summary: The agenda setting process is really a set of processes, and the administrative role is actually an amalgam of varying and complex roles. 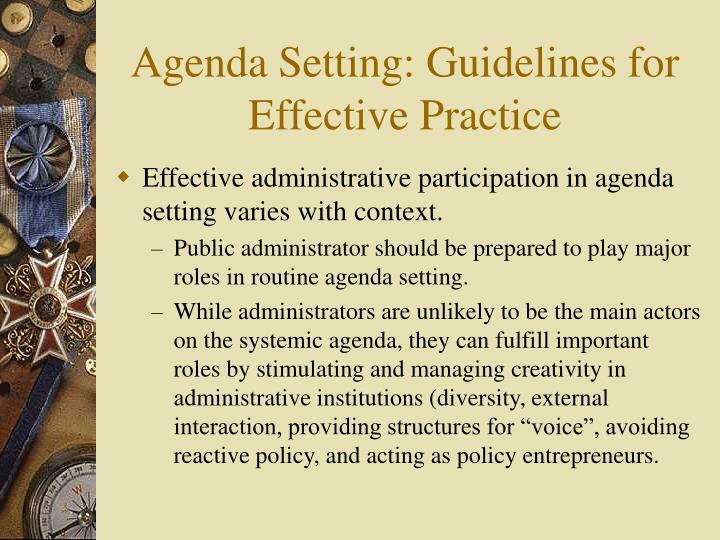 Effective administrative participation in agenda setting varies with context. 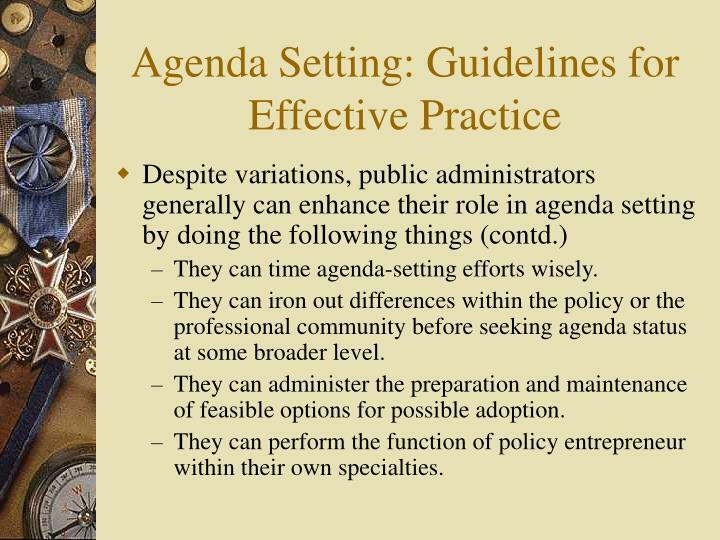 Public administrator should be prepared to play major roles in routine agenda setting. While administrators are unlikely to be the main actors on the systemic agenda, they can fulfill important roles by stimulating and managing creativity in administrative institutions (diversity, external interaction, providing structures for “voice”, avoiding reactive policy, and acting as policy entrepreneurs. 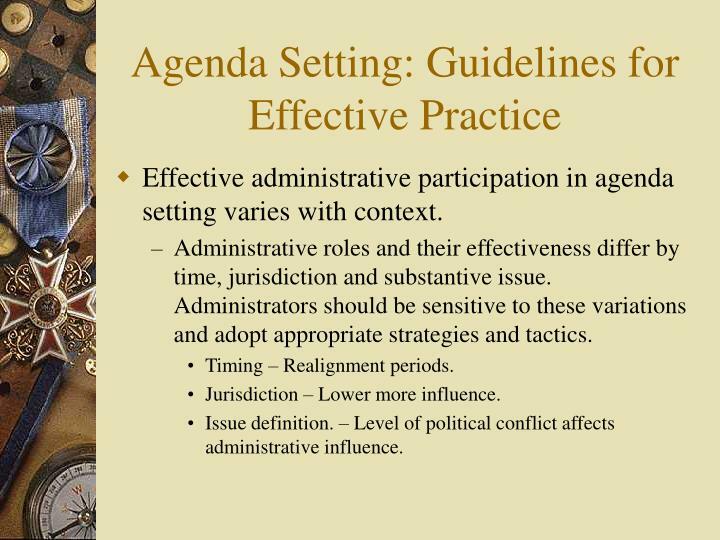 Administrative roles and their effectiveness differ by time, jurisdiction and substantive issue. Administrators should be sensitive to these variations and adopt appropriate strategies and tactics. Jurisdiction – Lower more influence. Issue definition. – Level of political conflict affects administrative influence. 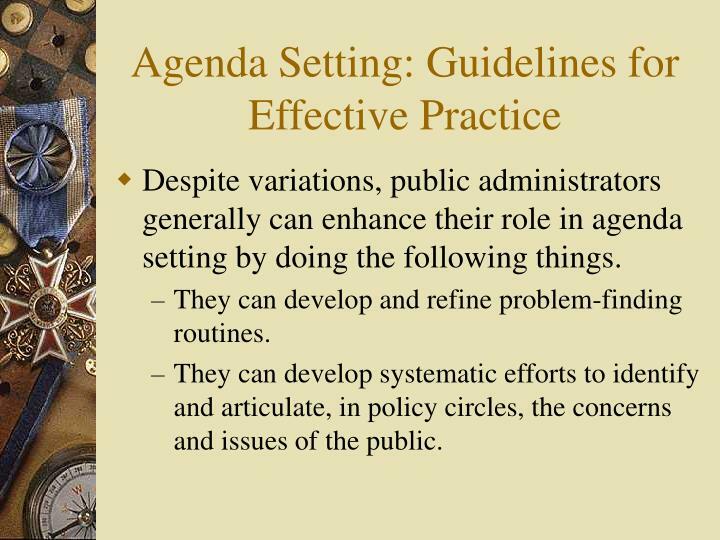 Despite variations, public administrators generally can enhance their role in agenda setting by doing the following things. They can develop and refine problem-finding routines. 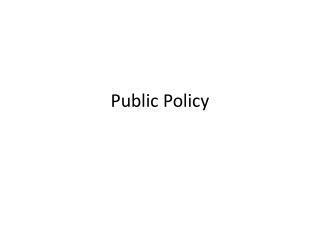 They can develop systematic efforts to identify and articulate, in policy circles, the concerns and issues of the public. They can create and refine contacts with groups of specialists external to the agency. They can retain in-house research and policy monitoring instead of contracting it out. 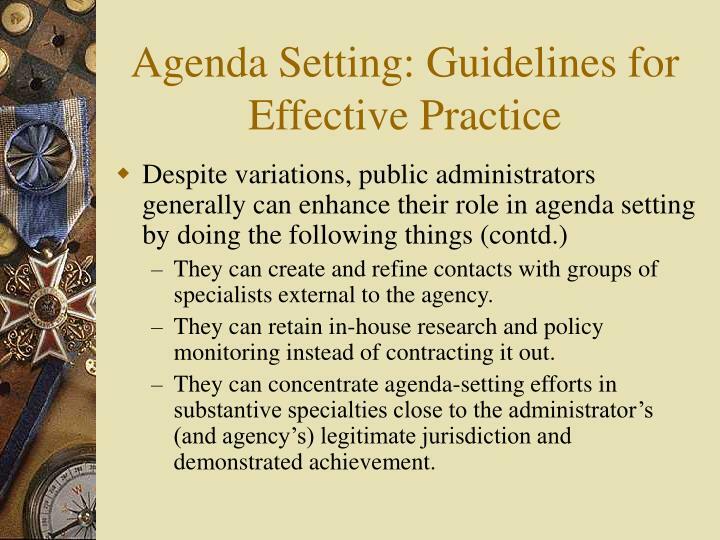 They can concentrate agenda-setting efforts in substantive specialties close to the administrator’s (and agency’s) legitimate jurisdiction and demonstrated achievement. They can time agenda-setting efforts wisely. They can iron out differences within the policy or the professional community before seeking agenda status at some broader level. They can administer the preparation and maintenance of feasible options for possible adoption. 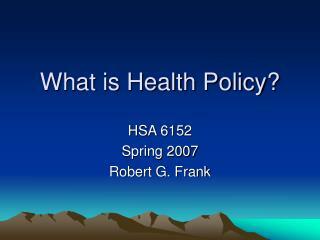 They can perform the function of policy entrepreneur within their own specialties. Through all of these efforts at effective participation in the process, administrators should remain acutely aware of the normative issues at stake. 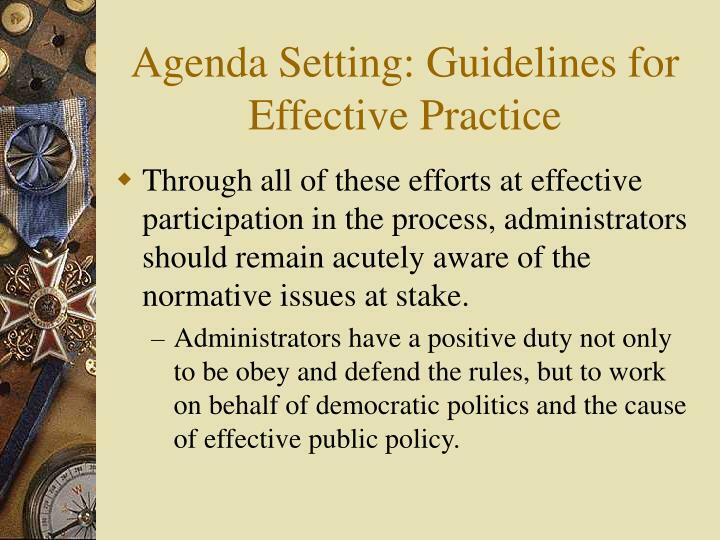 Administrators have a positive duty not only to be obey and defend the rules, but to work on behalf of democratic politics and the cause of effective public policy. 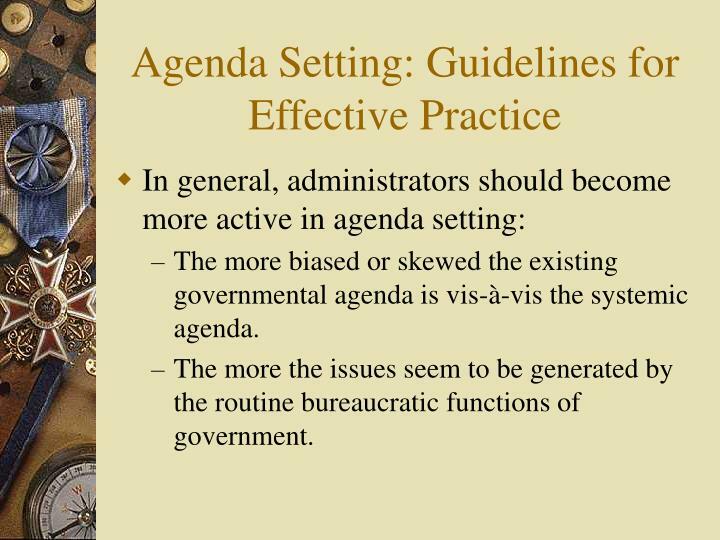 The more biased or skewed the existing governmental agenda is vis-à-vis the systemic agenda. The more the issues seem to be generated by the routine bureaucratic functions of government. 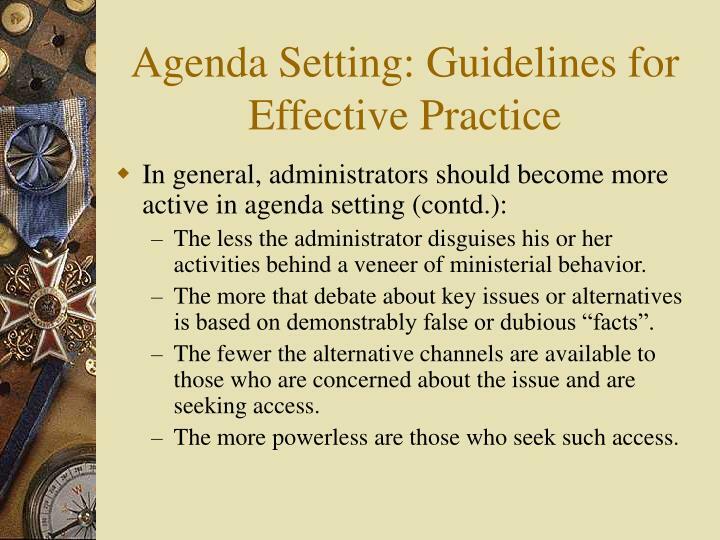 The less the administrator disguises his or her activities behind a veneer of ministerial behavior. The more that debate about key issues or alternatives is based on demonstrably false or dubious “facts”. The fewer the alternative channels are available to those who are concerned about the issue and are seeking access. The more powerless are those who seek such access. 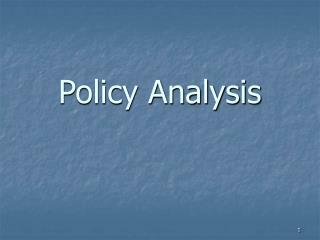 Policy analysis can be defined as simply an estimate of what would happen if some governmental procedure were changed. 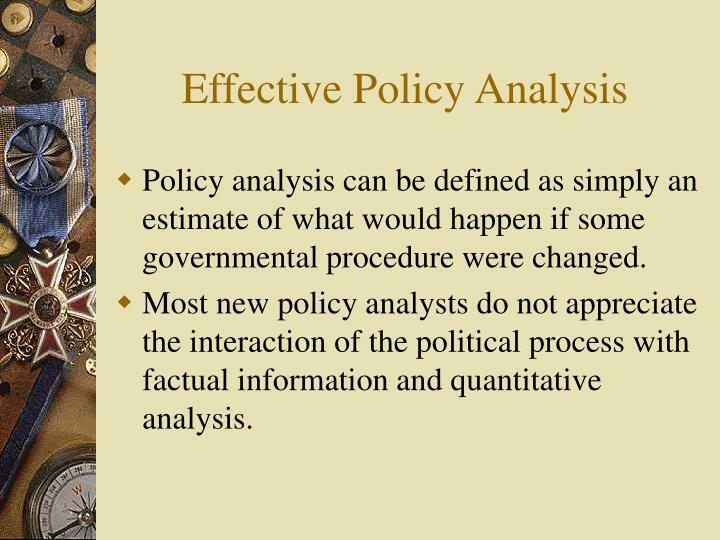 Most new policy analysts do not appreciate the interaction of the political process with factual information and quantitative analysis. 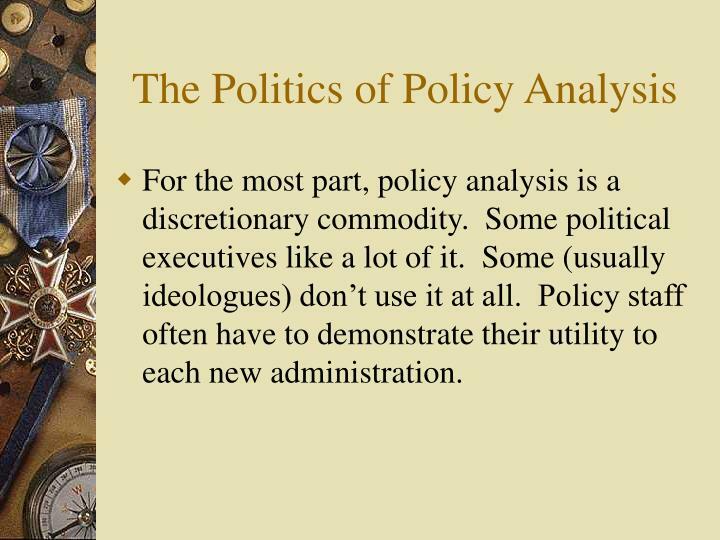 For the most part, policy analysis is a discretionary commodity. Some political executives like a lot of it. Some (usually ideologues) don’t use it at all. Policy staff often have to demonstrate their utility to each new administration. 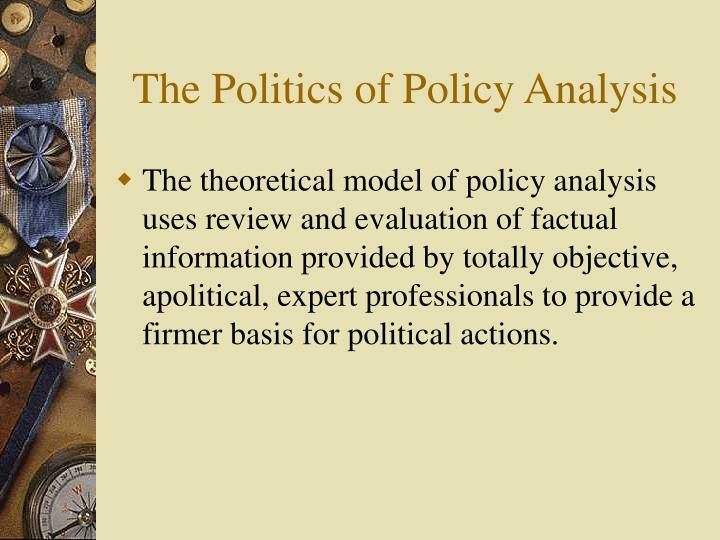 The theoretical model of policy analysis uses review and evaluation of factual information provided by totally objective, apolitical, expert professionals to provide a firmer basis for political actions. Once the results are available, they are considered in the context of a political template provided by elected and appointed officials and producing a set of alternatives with different physical, social, economic, and political costs and benefits. 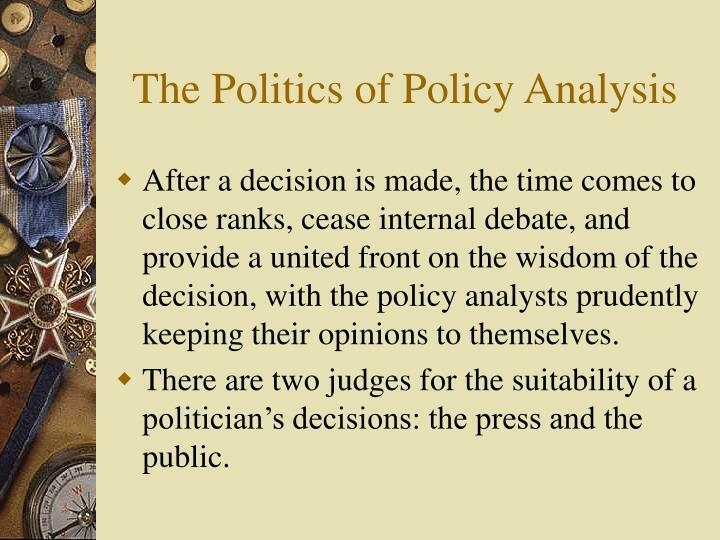 After a decision is made, the time comes to close ranks, cease internal debate, and provide a united front on the wisdom of the decision, with the policy analysts prudently keeping their opinions to themselves. There are two judges for the suitability of a politician’s decisions: the press and the public. 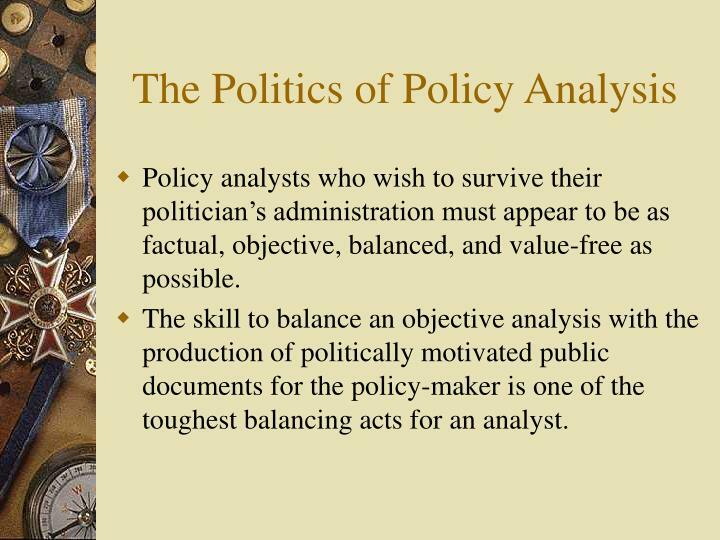 Policy analysts who wish to survive their politician’s administration must appear to be as factual, objective, balanced, and value-free as possible. The skill to balance an objective analysis with the production of politically motivated public documents for the policy-maker is one of the toughest balancing acts for an analyst. 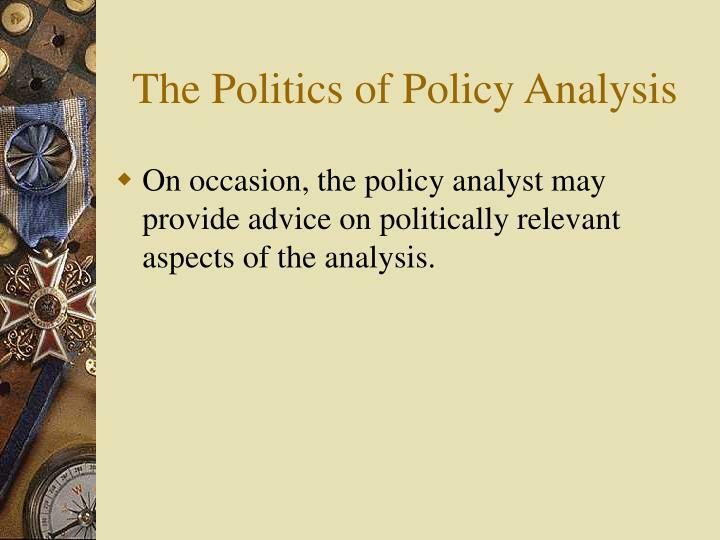 On occasion, the policy analyst may provide advice on politically relevant aspects of the analysis. 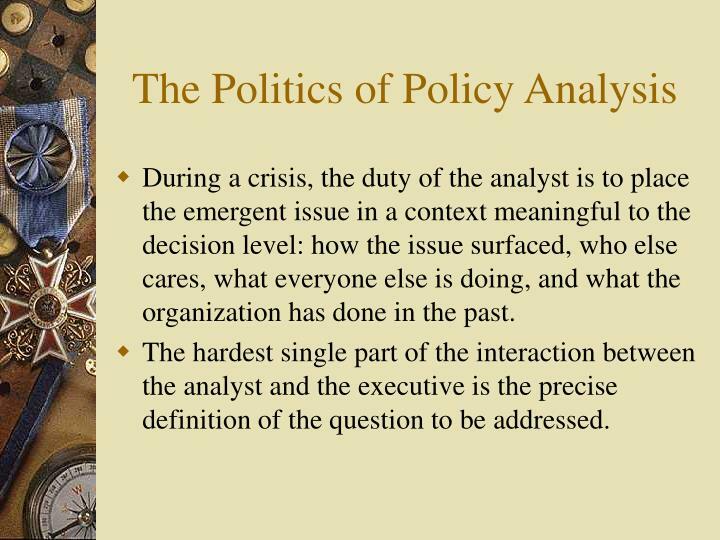 During a crisis, the duty of the analyst is to place the emergent issue in a context meaningful to the decision level: how the issue surfaced, who else cares, what everyone else is doing, and what the organization has done in the past. 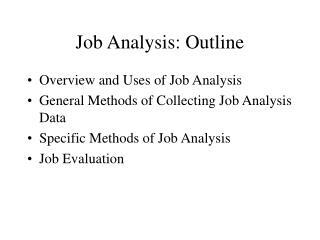 The hardest single part of the interaction between the analyst and the executive is the precise definition of the question to be addressed. 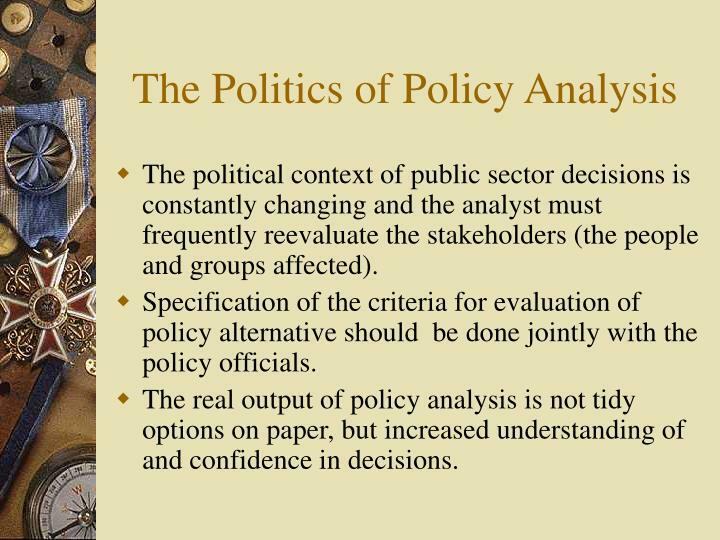 The political context of public sector decisions is constantly changing and the analyst must frequently reevaluate the stakeholders (the people and groups affected). 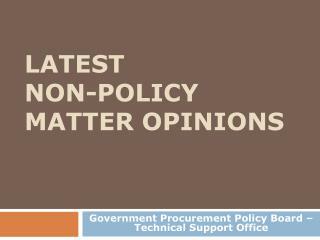 Specification of the criteria for evaluation of policy alternative should be done jointly with the policy officials. 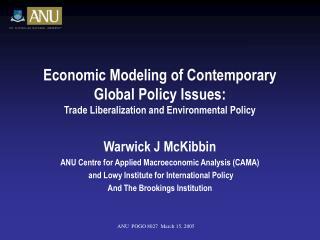 The real output of policy analysis is not tidy options on paper, but increased understanding of and confidence in decisions. 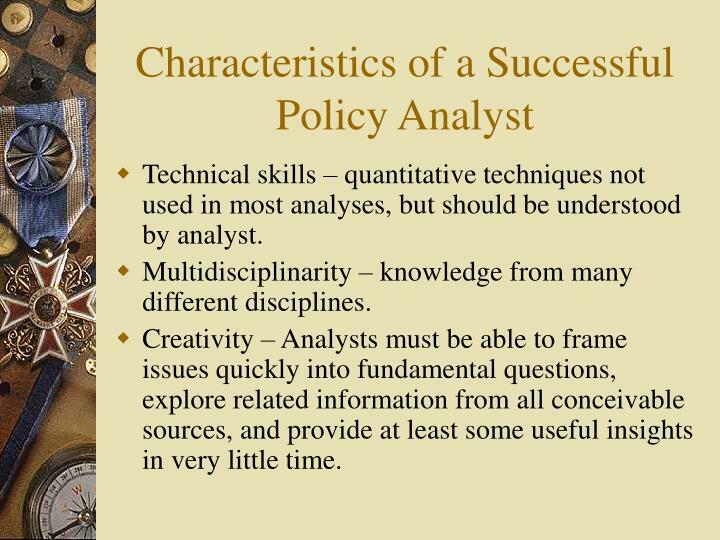 Technical skills – quantitative techniques not used in most analyses, but should be understood by analyst. Multidisciplinarity – knowledge from many different disciplines. Creativity – Analysts must be able to frame issues quickly into fundamental questions, explore related information from all conceivable sources, and provide at least some useful insights in very little time. Clarity – The model must get the point across clearly and quickly. 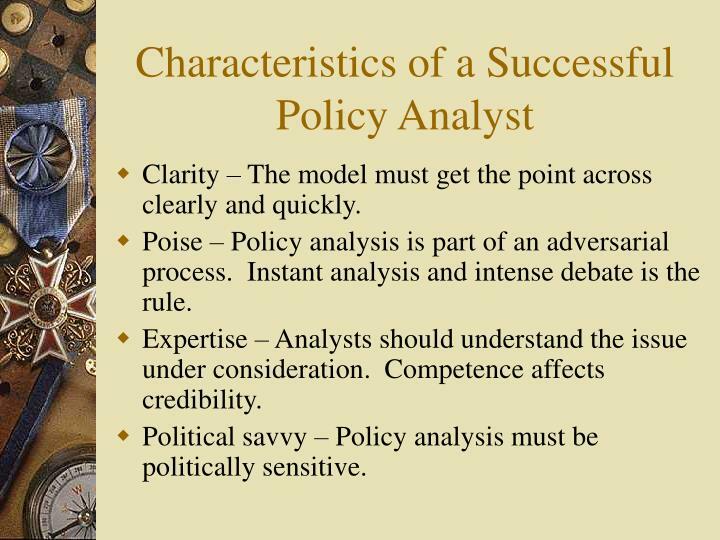 Poise – Policy analysis is part of an adversarial process. Instant analysis and intense debate is the rule. Expertise – Analysts should understand the issue under consideration. Competence affects credibility. 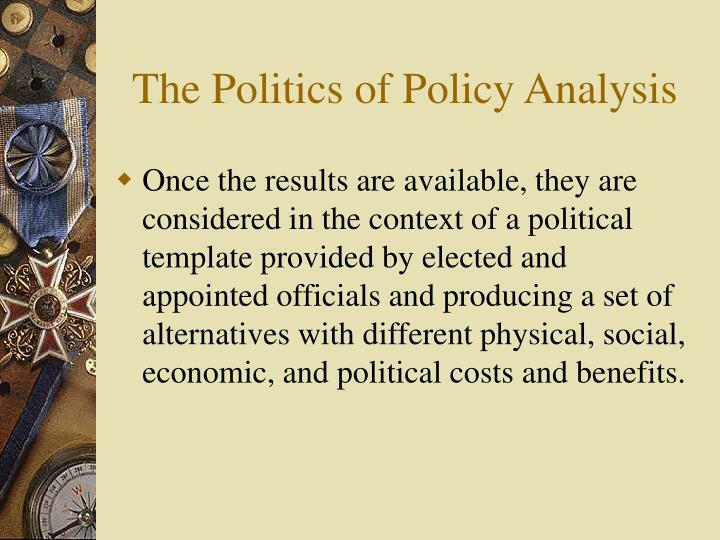 Political savvy – Policy analysis must be politically sensitive. 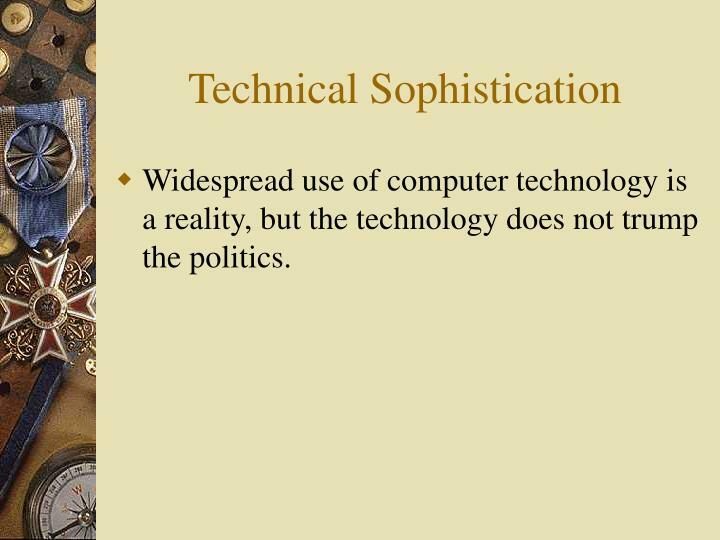 Widespread use of computer technology is a reality, but the technology does not trump the politics. 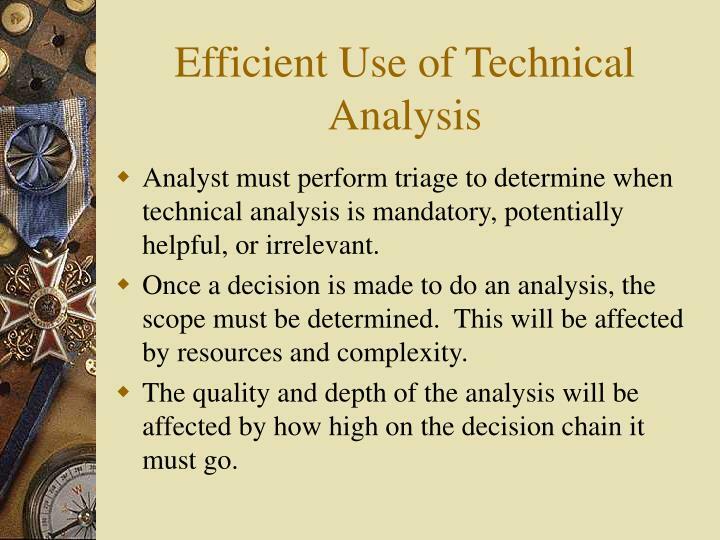 Analyst must perform triage to determine when technical analysis is mandatory, potentially helpful, or irrelevant. 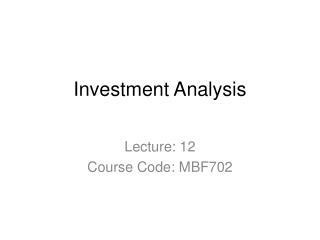 Once a decision is made to do an analysis, the scope must be determined. This will be affected by resources and complexity. The quality and depth of the analysis will be affected by how high on the decision chain it must go. Does the policy get put in place as desired by the legislators or the agency head? If not, what has occurred to block or modify the desired change. 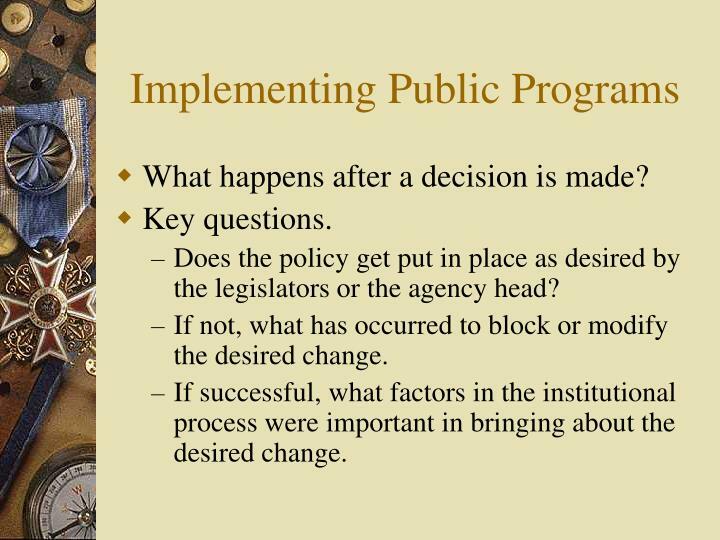 If successful, what factors in the institutional process were important in bringing about the desired change. 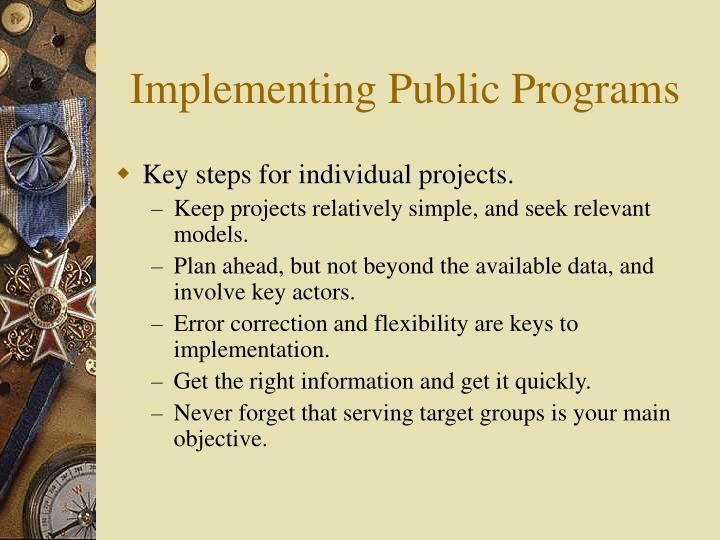 Key steps for individual projects. Keep projects relatively simple, and seek relevant models. Plan ahead, but not beyond the available data, and involve key actors. Error correction and flexibility are keys to implementation. Get the right information and get it quickly. Never forget that serving target groups is your main objective. 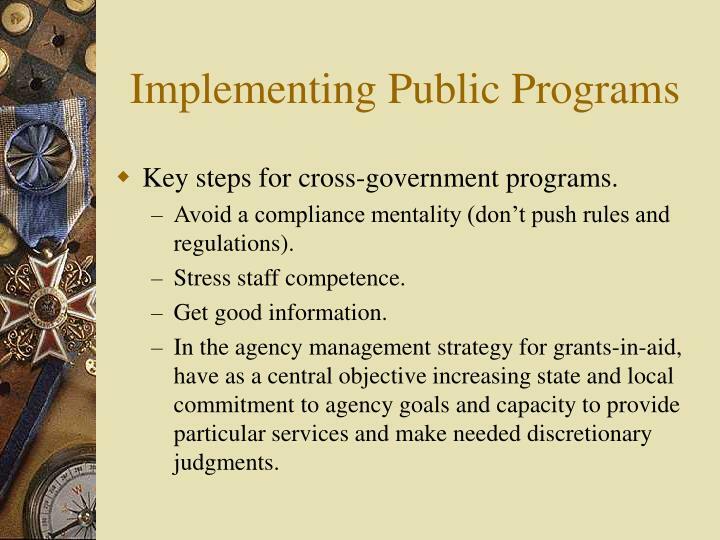 Key steps for cross-government programs. Avoid a compliance mentality (don’t push rules and regulations). 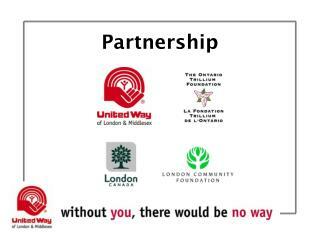 In the agency management strategy for grants-in-aid, have as a central objective increasing state and local commitment to agency goals and capacity to provide particular services and make needed discretionary judgments. 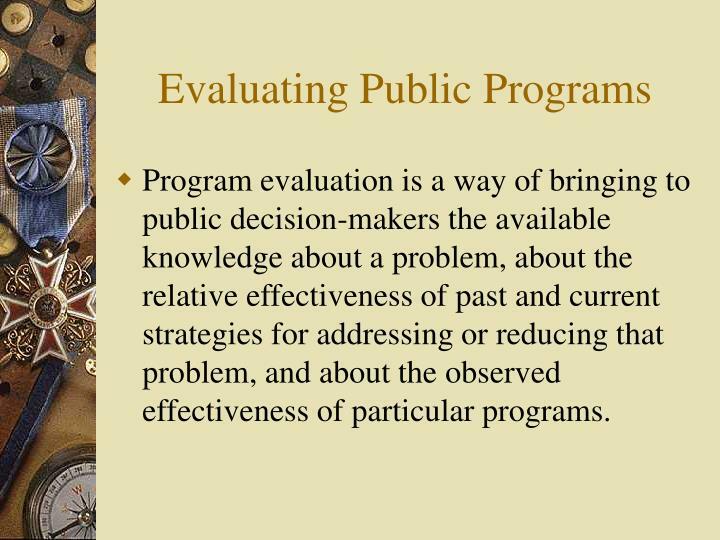 Program evaluation is a way of bringing to public decision-makers the available knowledge about a problem, about the relative effectiveness of past and current strategies for addressing or reducing that problem, and about the observed effectiveness of particular programs. Policy formulation – to assess or justify the need for a new program and to design it optimally on the basis of past experience. 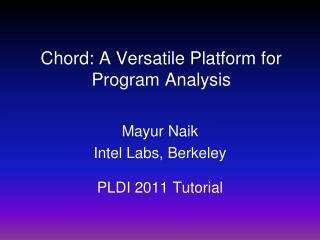 Information on the problem addressed by the program: how big is it? What is its frequency and direction? How is it changing? 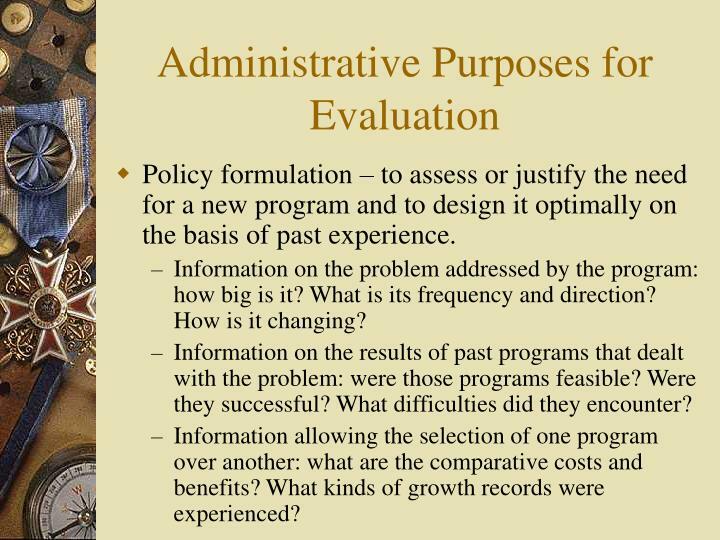 Information on the results of past programs that dealt with the problem: were those programs feasible? Were they successful? What difficulties did they encounter? 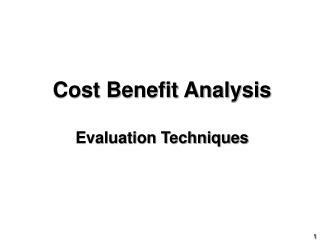 Information allowing the selection of one program over another: what are the comparative costs and benefits? What kinds of growth records were experienced? 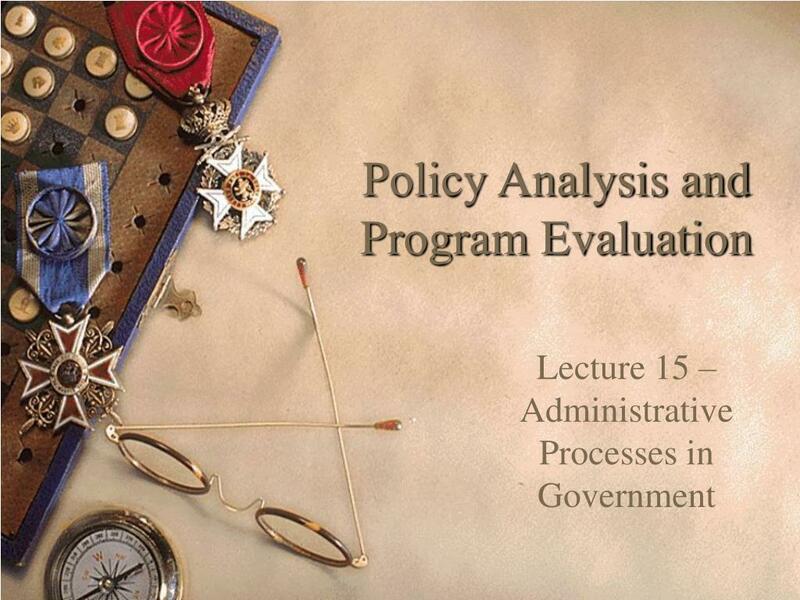 Policy execution – to ensure that a program is implemented in the most cost-effective and technically competent way. 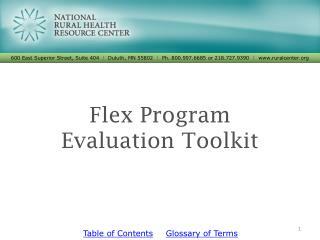 Information on program implementation: how operational is the program? How similar is it across sites? Does it conform to the policies and expectations formulated? How much does it cost? How do stakeholders feel about it? Are there delivery problems or error, fraud, and abuse? 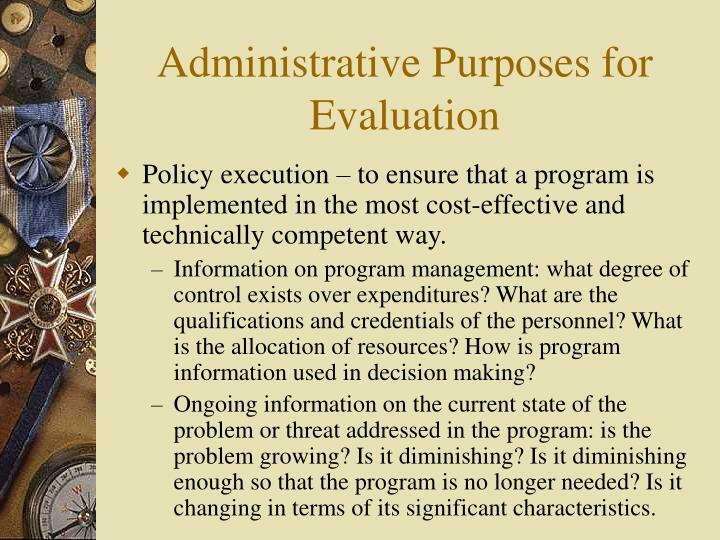 Information on program management: what degree of control exists over expenditures? What are the qualifications and credentials of the personnel? What is the allocation of resources? 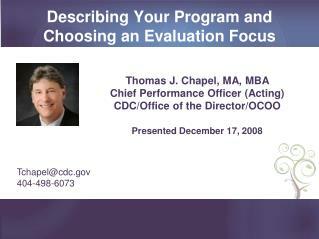 How is program information used in decision making? Ongoing information on the current state of the problem or threat addressed in the program: is the problem growing? Is it diminishing? Is it diminishing enough so that the program is no longer needed? Is it changing in terms of its significant characteristics. 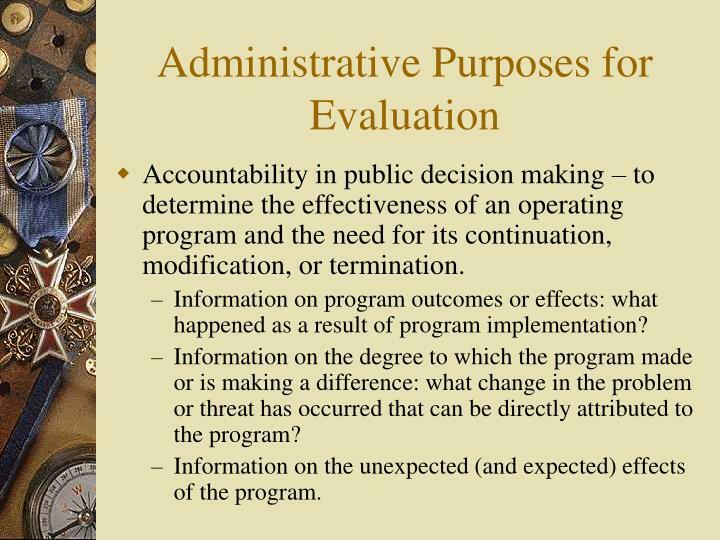 Accountability in public decision making – to determine the effectiveness of an operating program and the need for its continuation, modification, or termination. 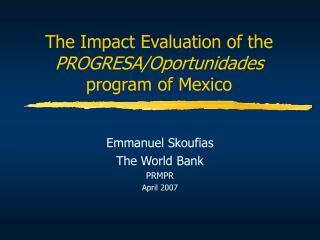 Information on program outcomes or effects: what happened as a result of program implementation? 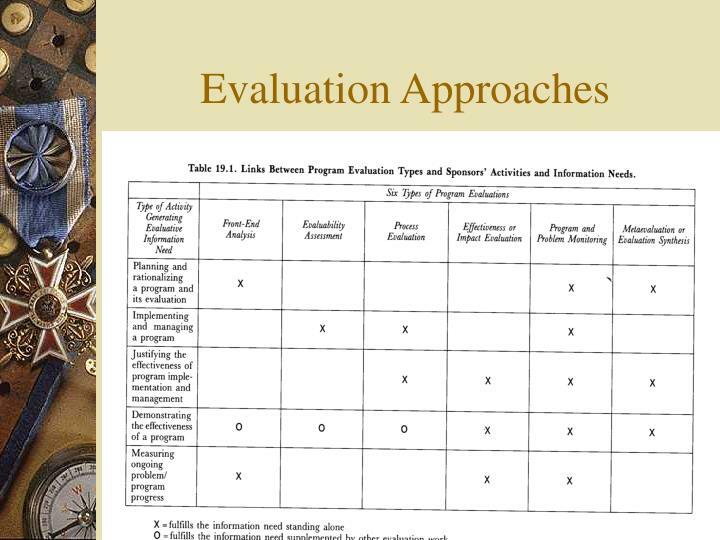 Information on the degree to which the program made or is making a difference: what change in the problem or threat has occurred that can be directly attributed to the program? Information on the unexpected (and expected) effects of the program. Executive branch (federal, state, local). Agency heads and top policy makers (need, effectiveness). 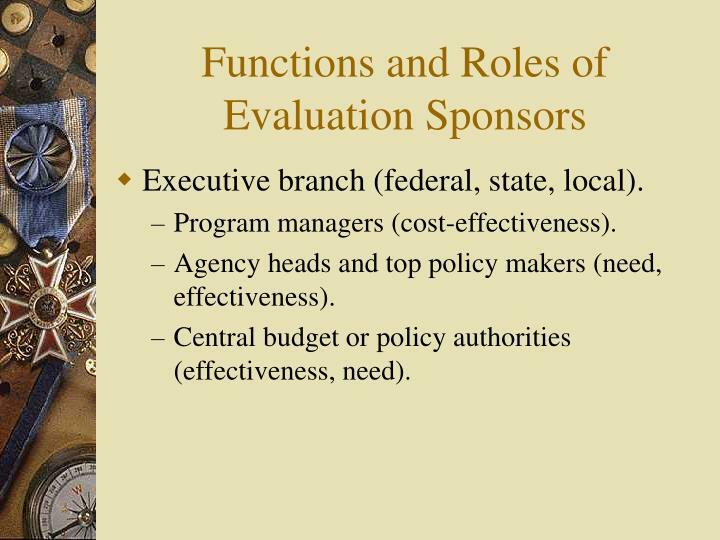 Central budget or policy authorities (effectiveness, need). 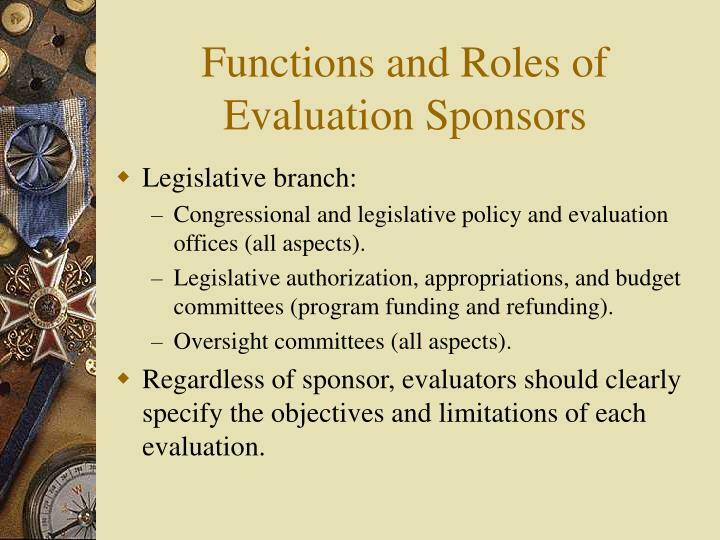 Congressional and legislative policy and evaluation offices (all aspects). Legislative authorization, appropriations, and budget committees (program funding and refunding). 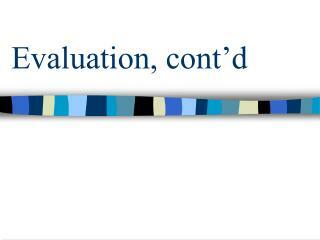 Regardless of sponsor, evaluators should clearly specify the objectives and limitations of each evaluation. 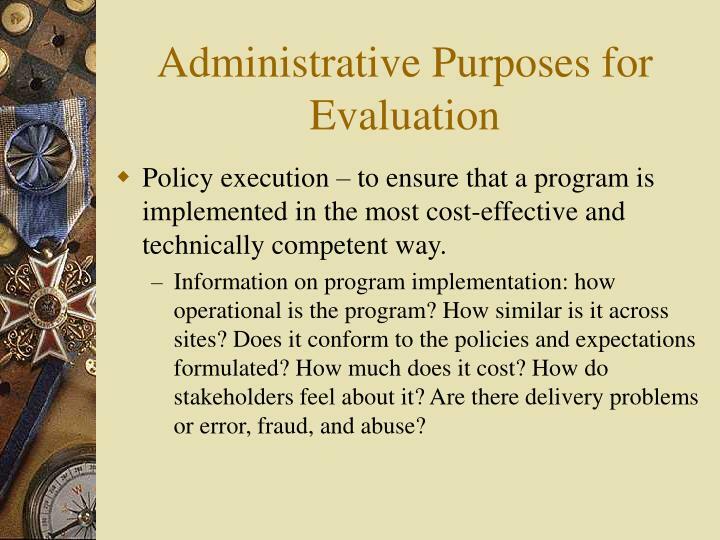 As a general rule, public administrators should expect their work on program effectiveness and feasibility to be of more general use than their work on implementation, which will be of most use to program managers and agency heads. 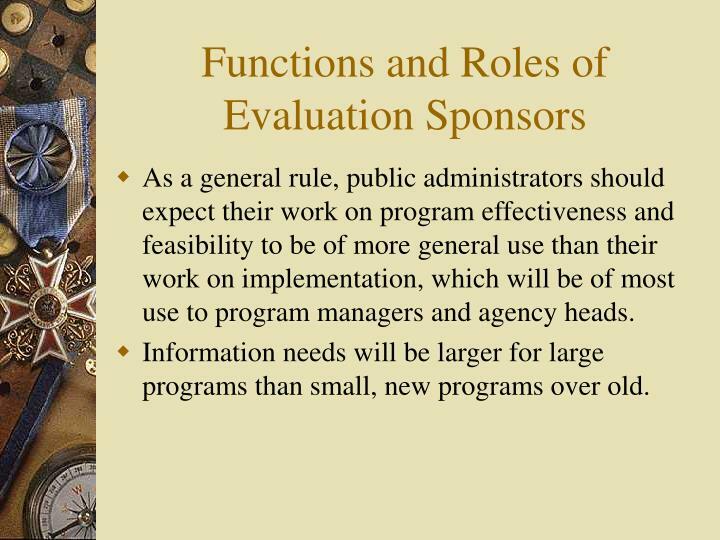 Information needs will be larger for large programs than small, new programs over old. 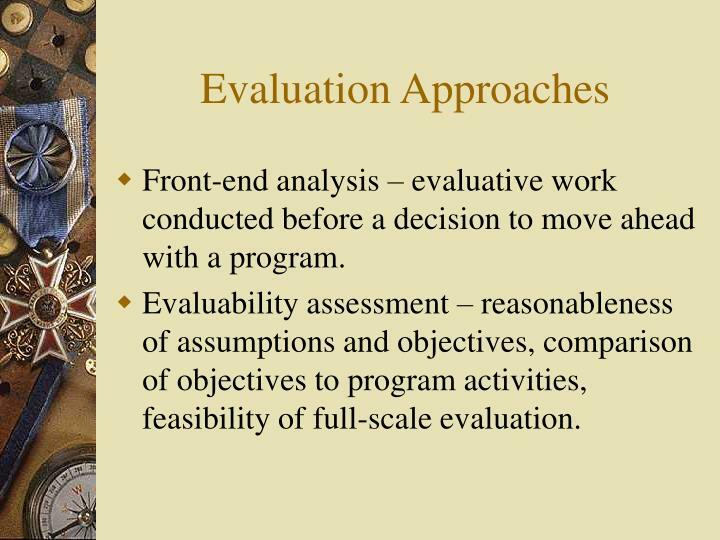 Front-end analysis – evaluative work conducted before a decision to move ahead with a program. 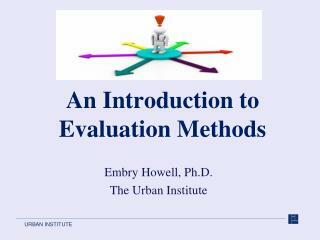 Evaluability assessment – reasonableness of assumptions and objectives, comparison of objectives to program activities, feasibility of full-scale evaluation. 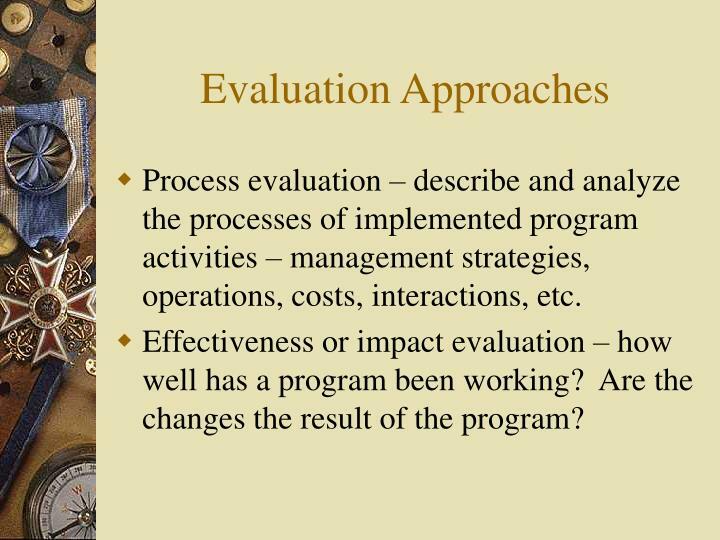 Process evaluation – describe and analyze the processes of implemented program activities – management strategies, operations, costs, interactions, etc. 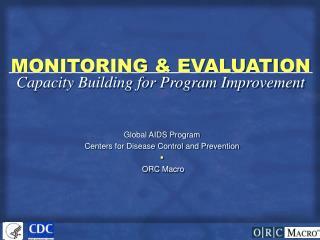 Effectiveness or impact evaluation – how well has a program been working? 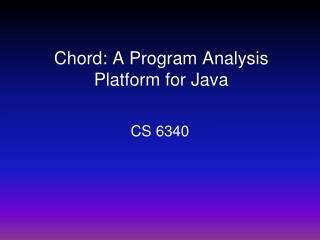 Are the changes the result of the program? 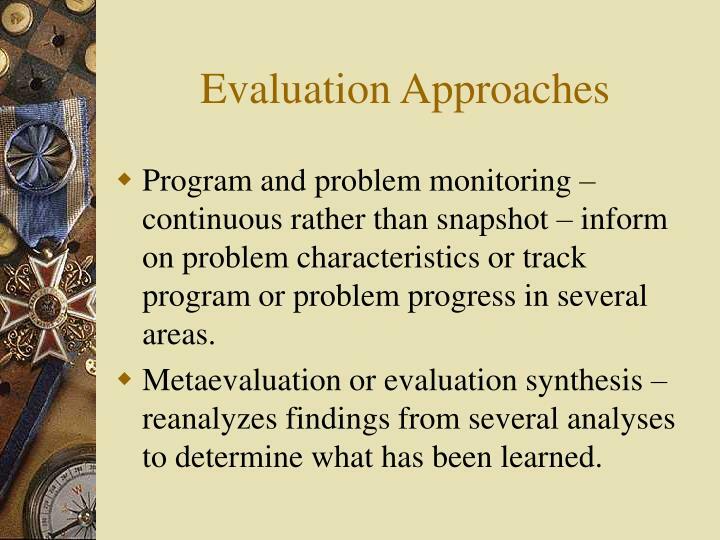 Program and problem monitoring – continuous rather than snapshot – inform on problem characteristics or track program or problem progress in several areas. 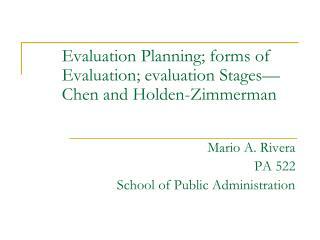 Metaevaluation or evaluation synthesis – reanalyzes findings from several analyses to determine what has been learned. 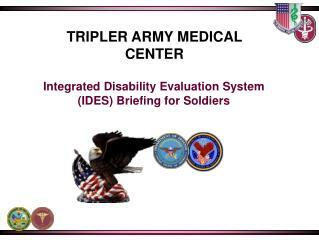 Integrating Needs Analysis, Assessment & Evaluation of Training -Integrating needs analysis, assessment &amp; evaluation of training. 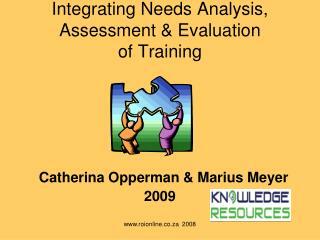 catherina opperman &amp; marius meyer 2009. focus. d e s i g n. needs analysis. assessment.